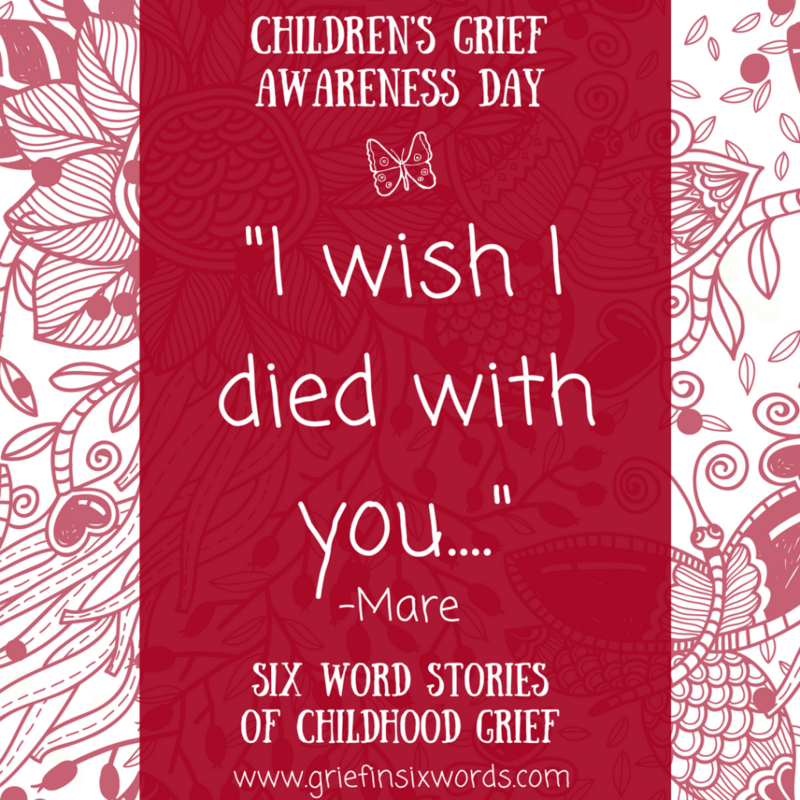 Created in 2008 by the Highmark Caring Place, A Center for Grieving Children, Adolescents and Their Families, and since recognized by organizations around the world, Children’s Grief Awareness Day is observed every year on the third Thursday in November (the Thursday before the U.S. holiday of Thanksgiving). 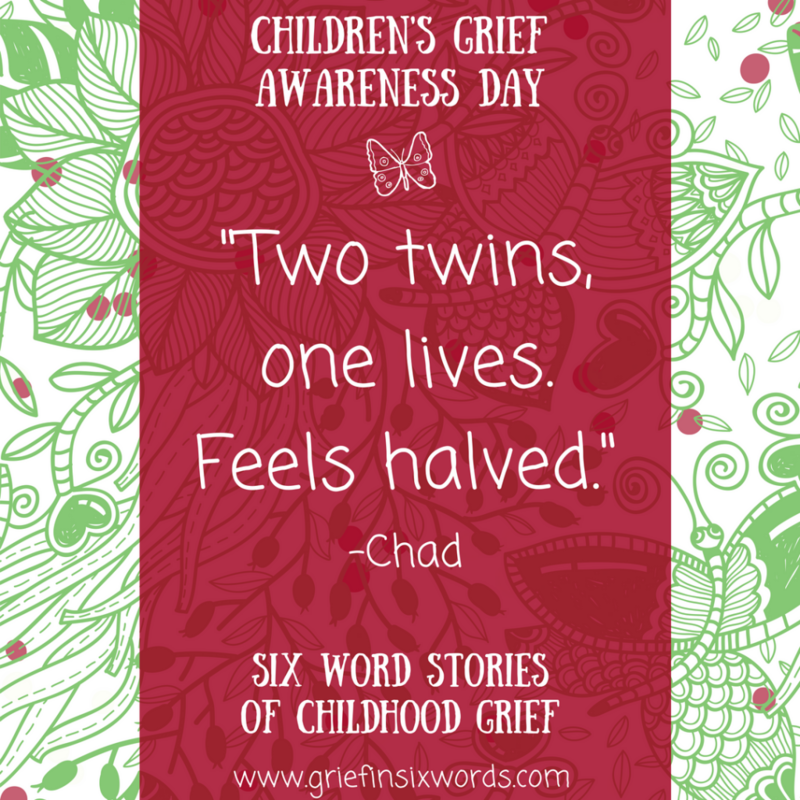 This time of year is a particularly appropriate time to support grieving children because the holiday season is often an especially difficult time after a death. 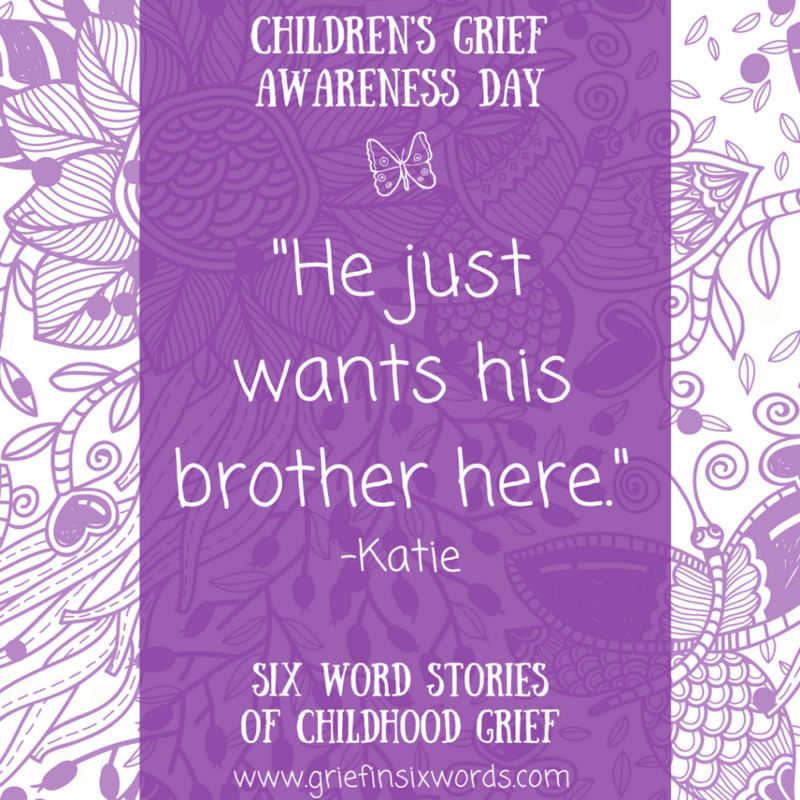 Children’s Grief Awareness Day seeks to bring attention to the fact that often support can make all the difference in the life of a grieving child. It provides an opportunity for all of us to raise awareness of the painful impact that the death of a loved one has in the life of a child, an opportunity to make sure that these children receive the support they need. 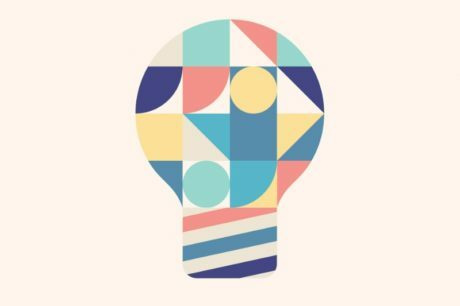 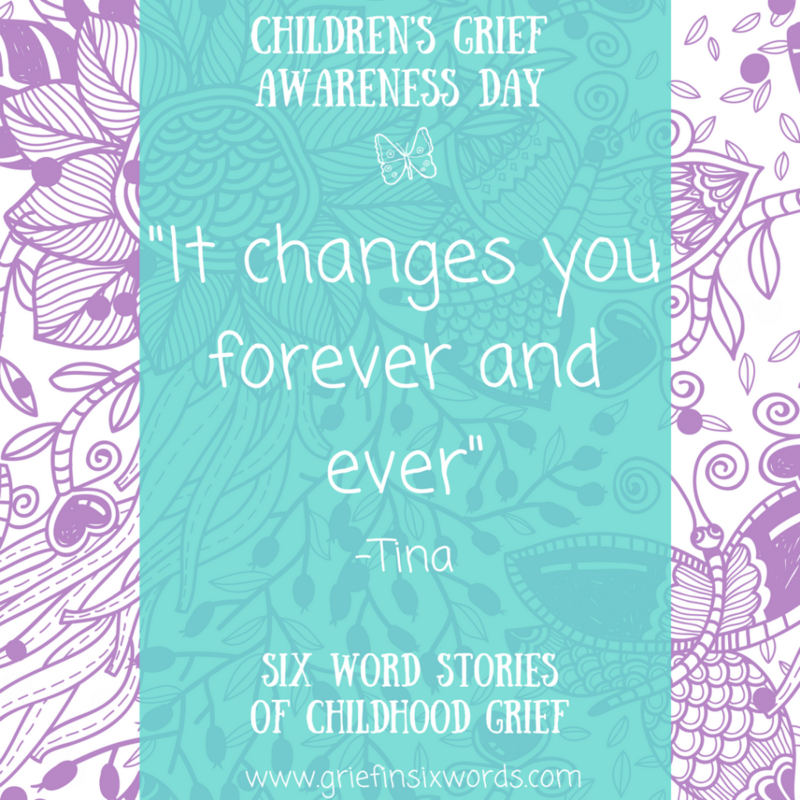 We have celebrated Children’s Grief Awareness Day in the past and, if you missed it, you can check out the CGAD challenge we did last year by reading this post. 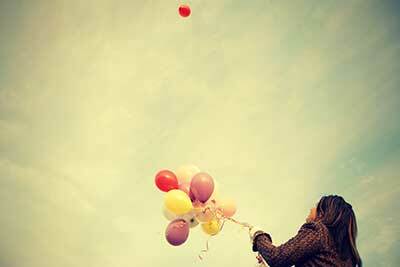 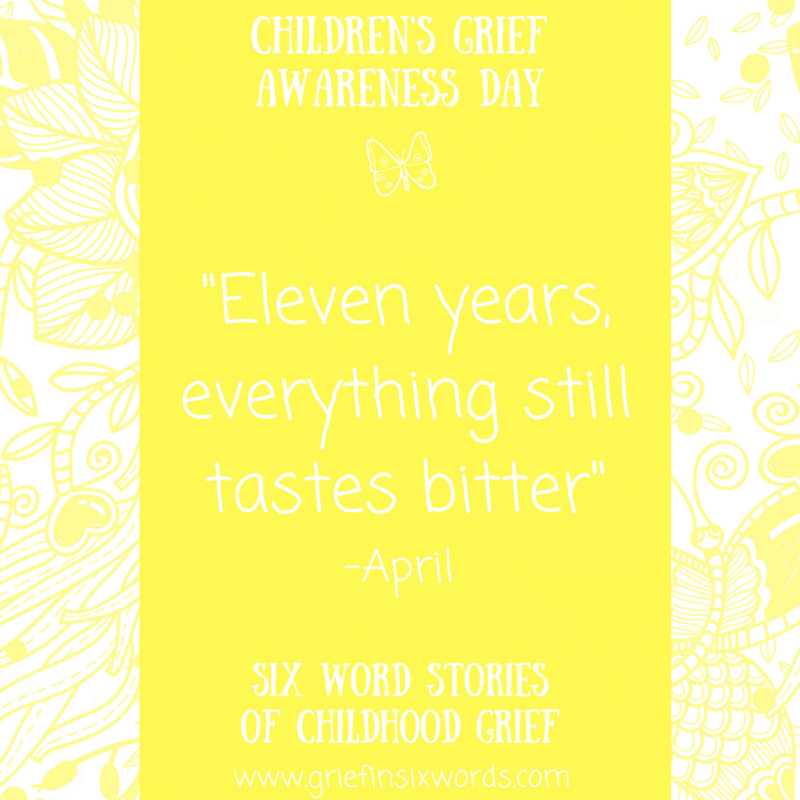 This year we again challenged you, our wonderful readers, to step up and share your experiences with childhood grief. 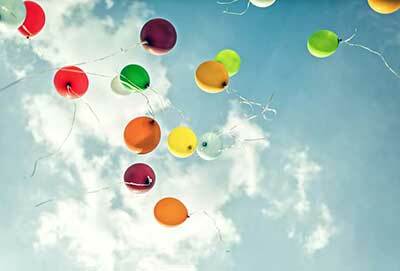 The catch? 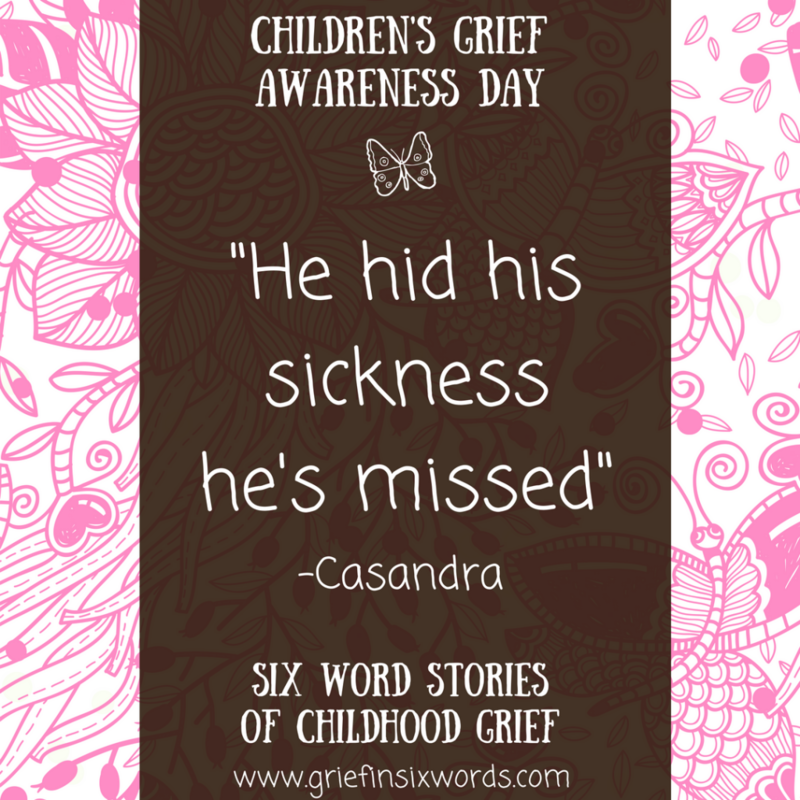 We asked you to share in the form of a six-word story and submit it on our site www.griefinsixwords.com. As usual, we were overwhelmed by the flood of incredible and powerful stories we received, and we hope to see even more coming in today. 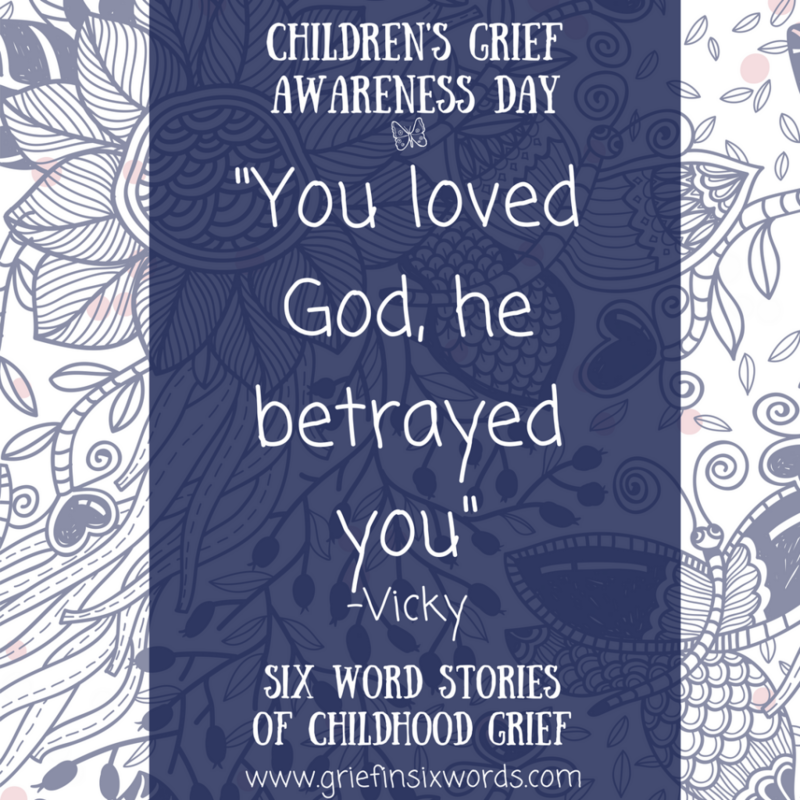 We wanted to share some of these stories here on WYG today to bring attention to childhood grief. Please share this post or any of the images below with others to help them understand the experience and scope of children’s grief. 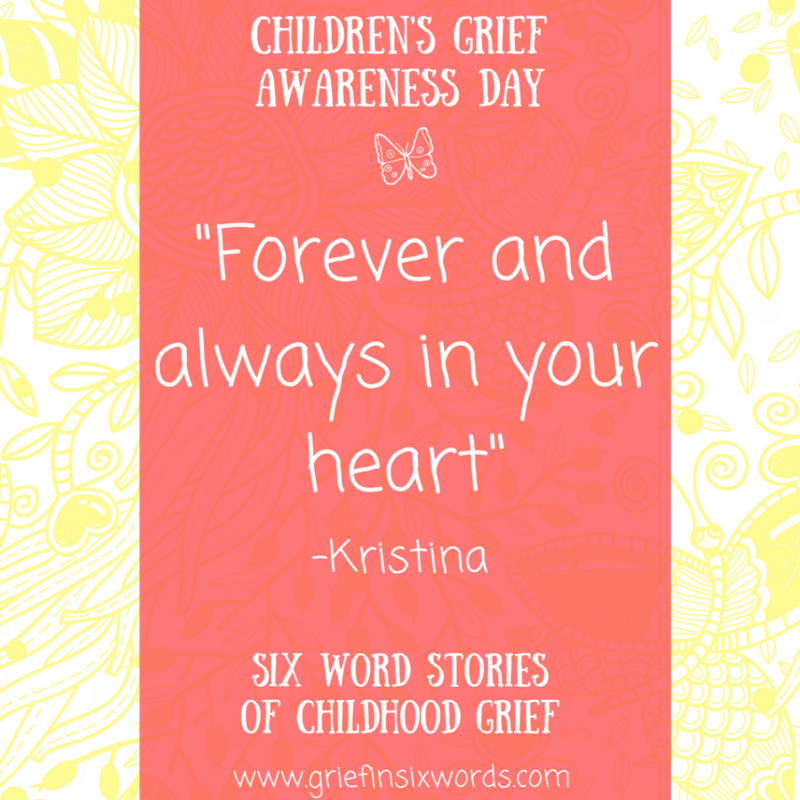 Don’t forget, you can make a huge difference in the life of a grieving child! 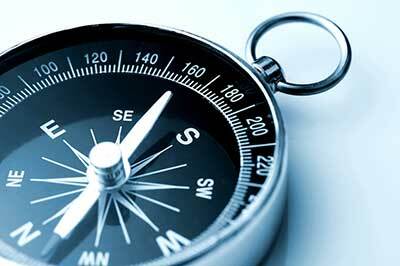 If you click on our categories at the top of the site you can find a range of articles on supporting kids. 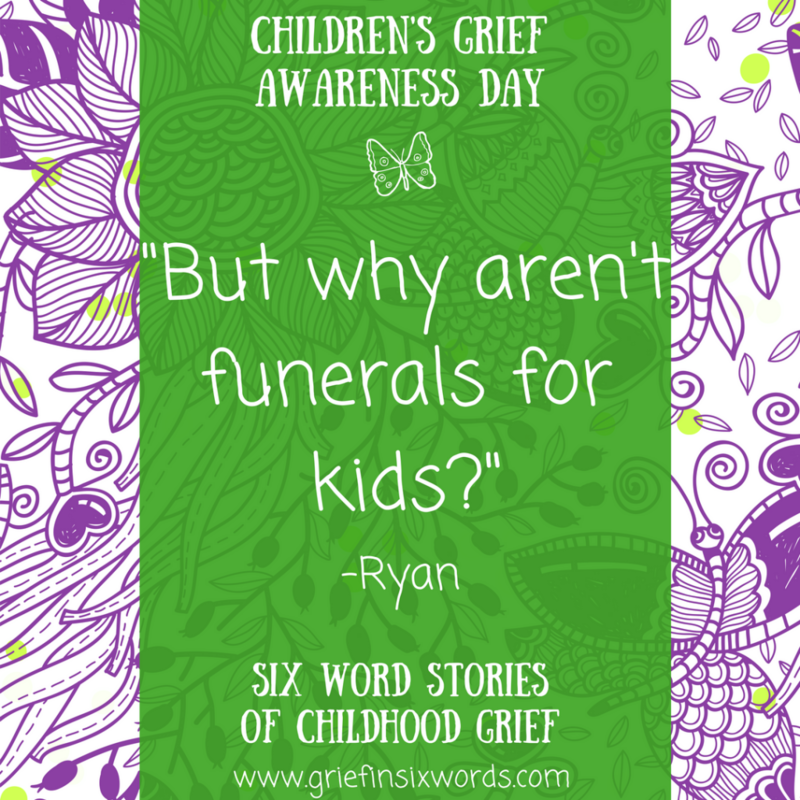 You can also visit the Children’s Grief Awareness Day website, the National Alliance for Grieving Children website, and the Moyer Foundation website for tons of helpful information and resources on supporting grieving kids. 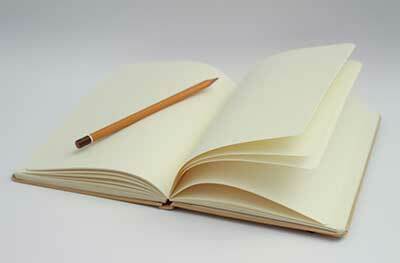 Without further ado, 64 six-word stories on the experience of grief in childhood. 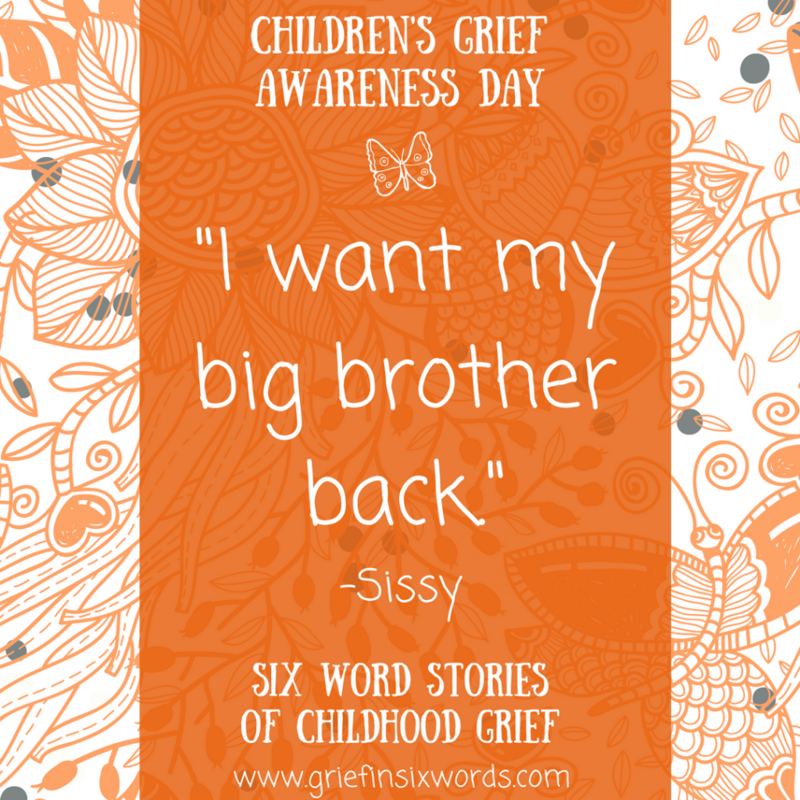 Feeling inspired to share your own six-word story about childhood grief? 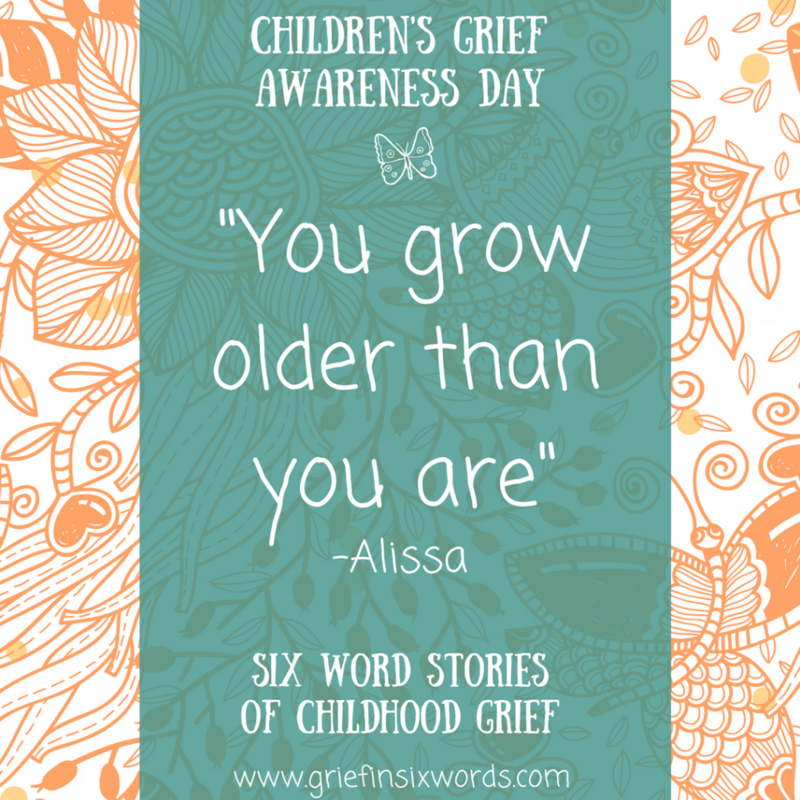 Head on over to griefinsixwords.com to submit. And, as always, subscribe to get our weekly grief posts. Just grief support, no spam! 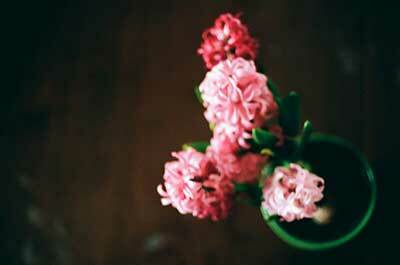 Promise. 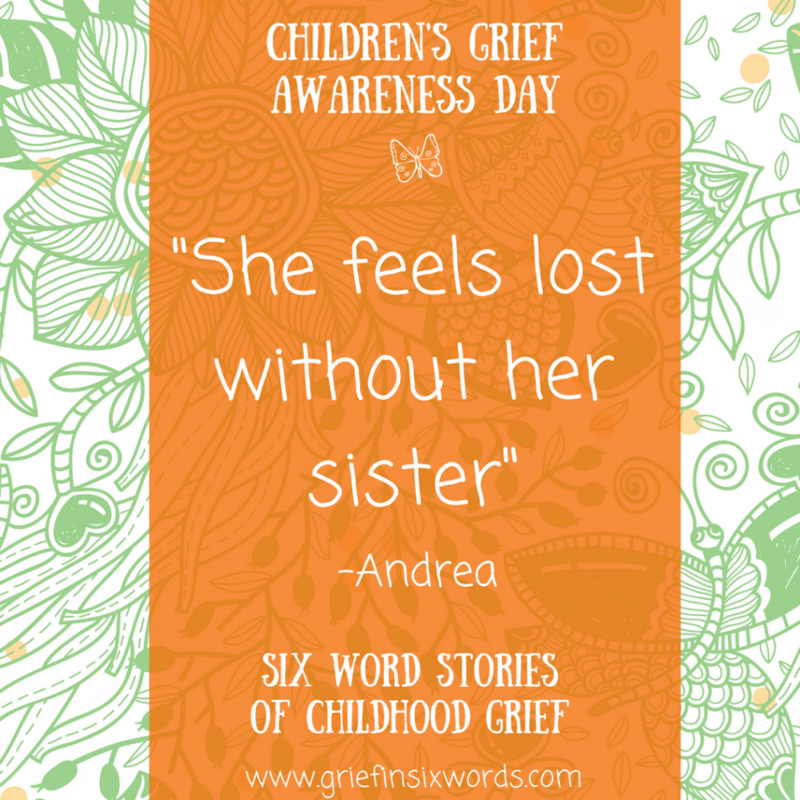 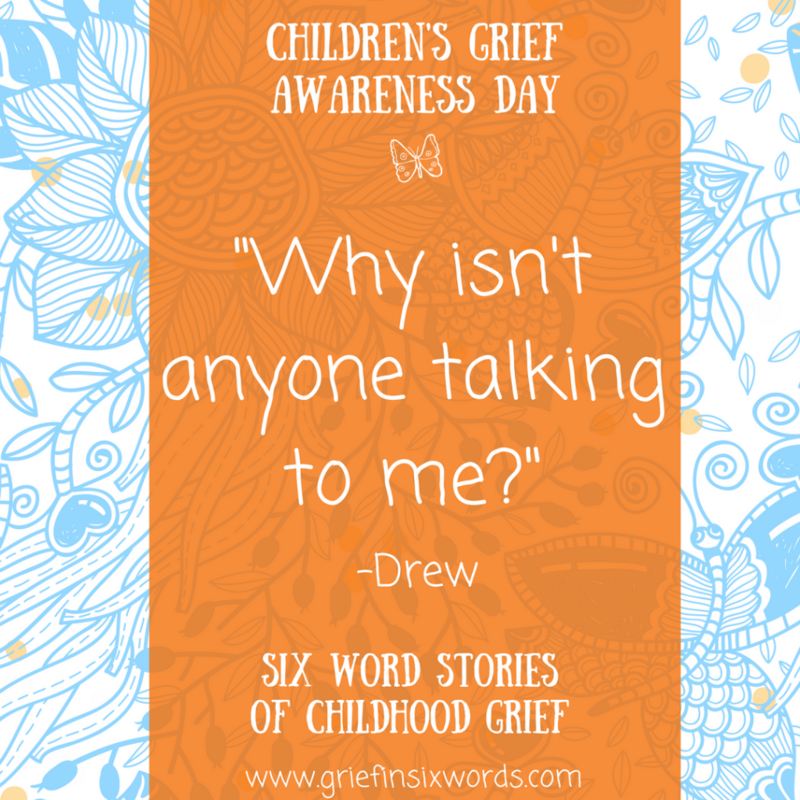 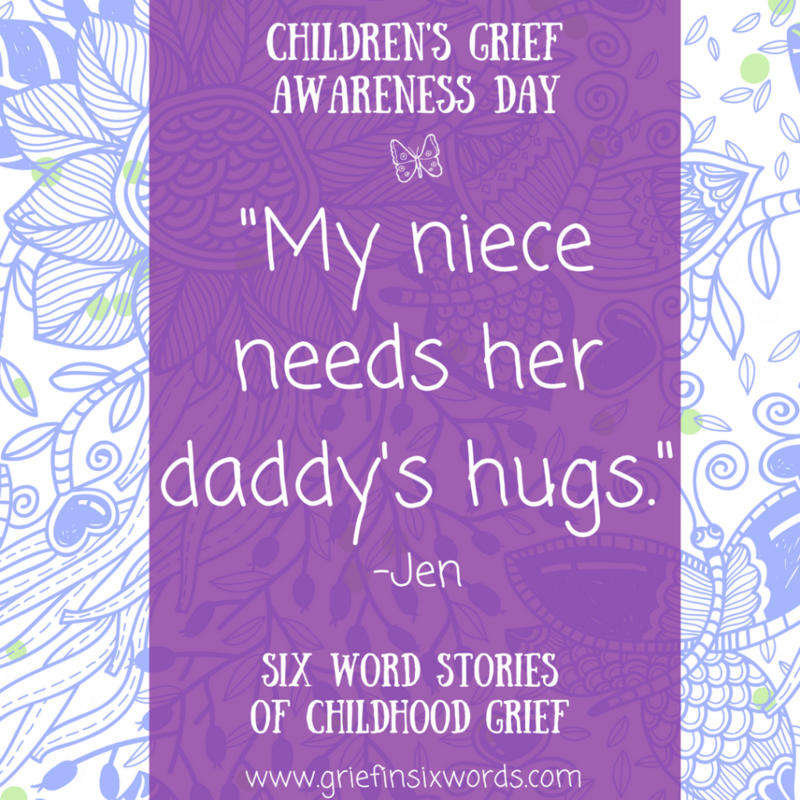 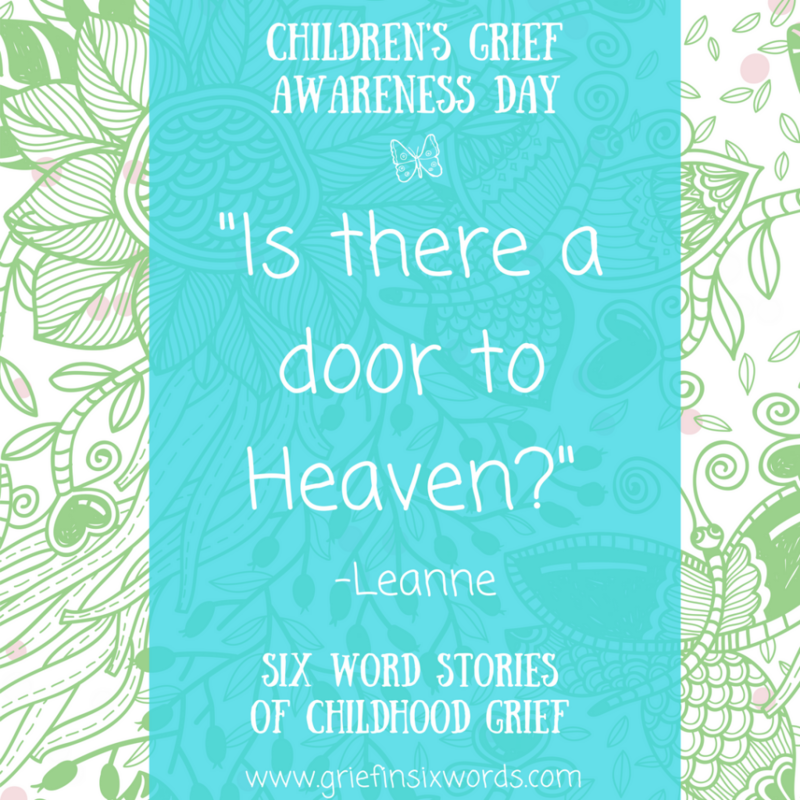 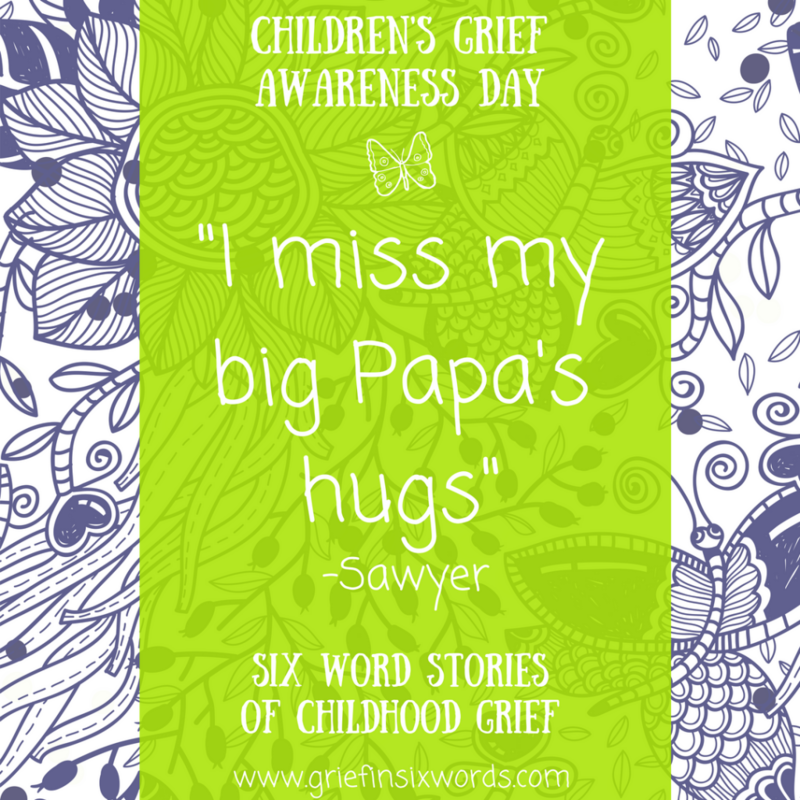 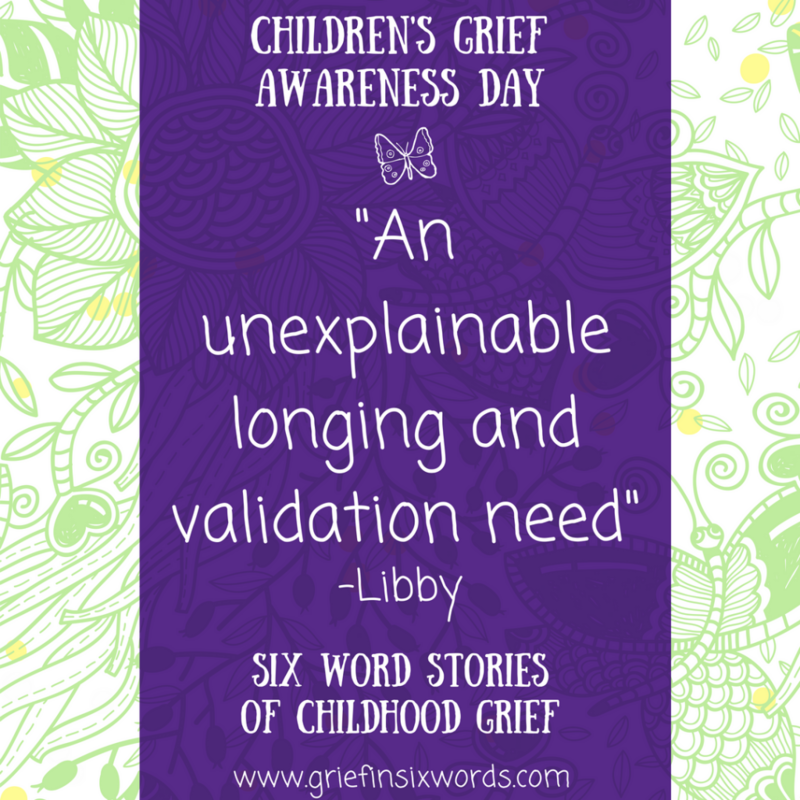 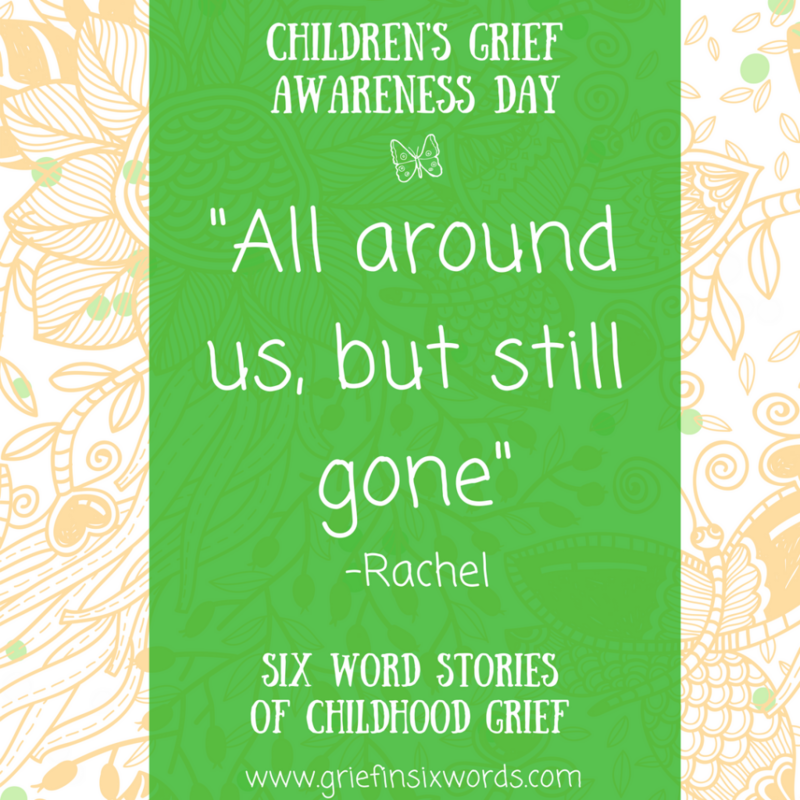 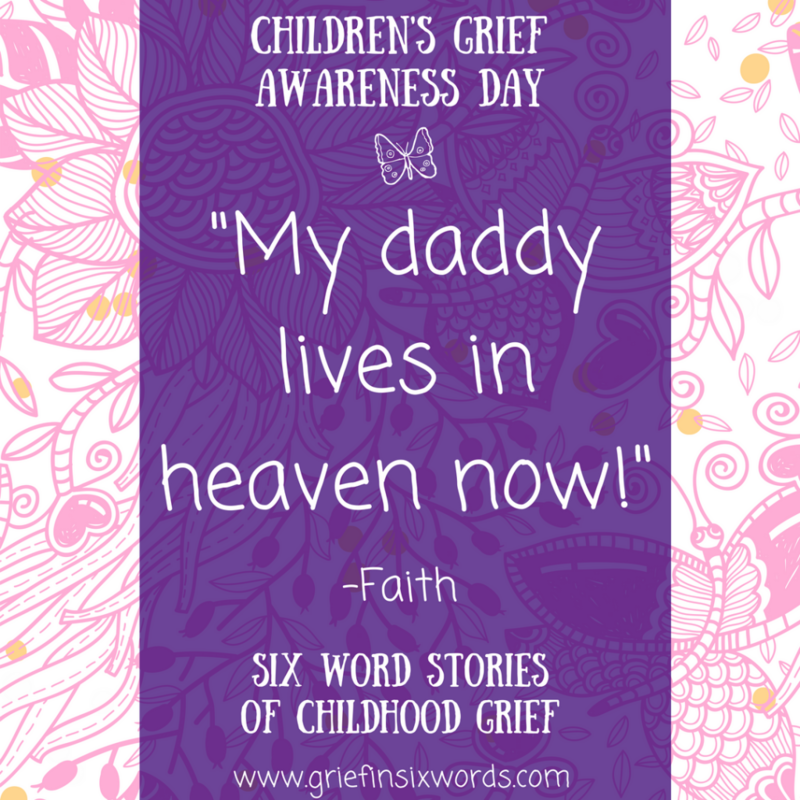 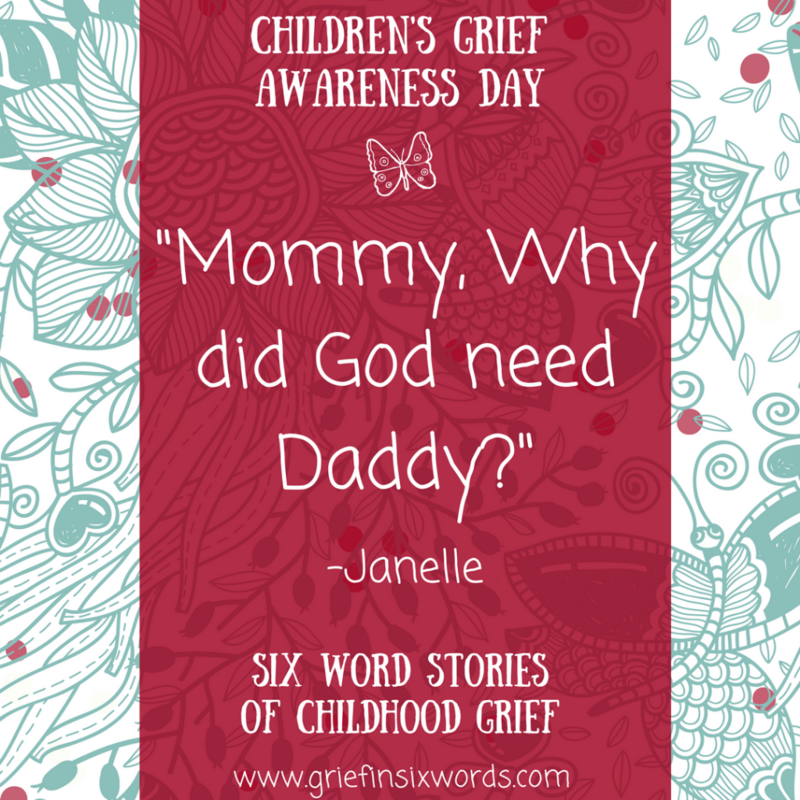 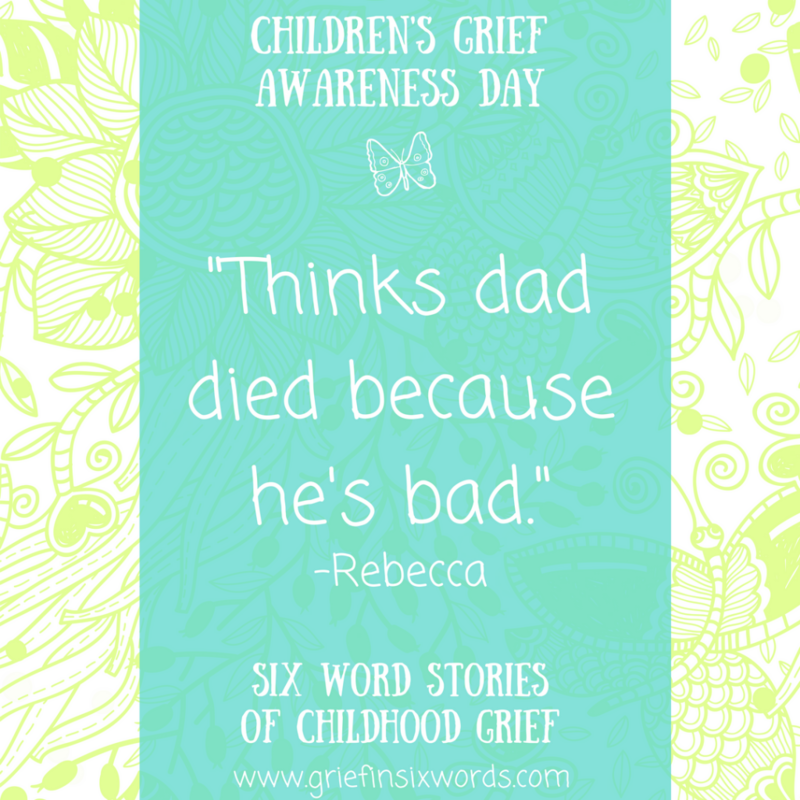 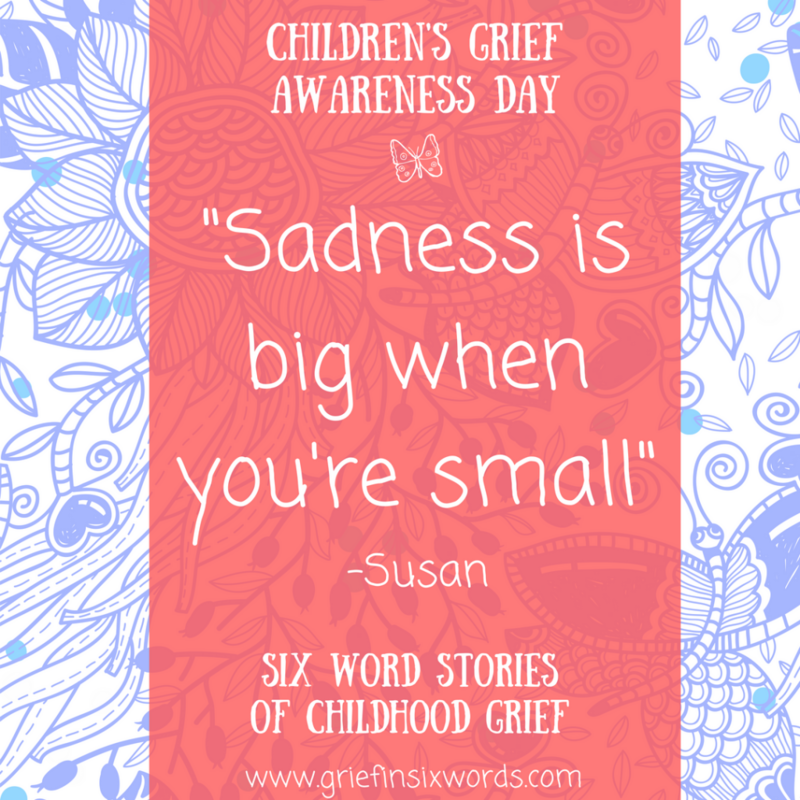 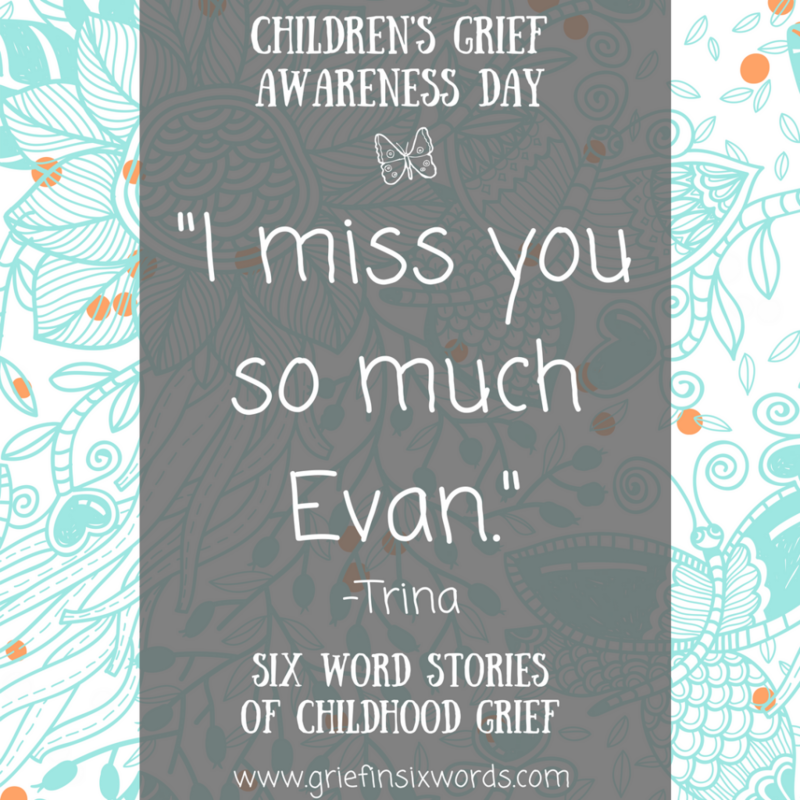 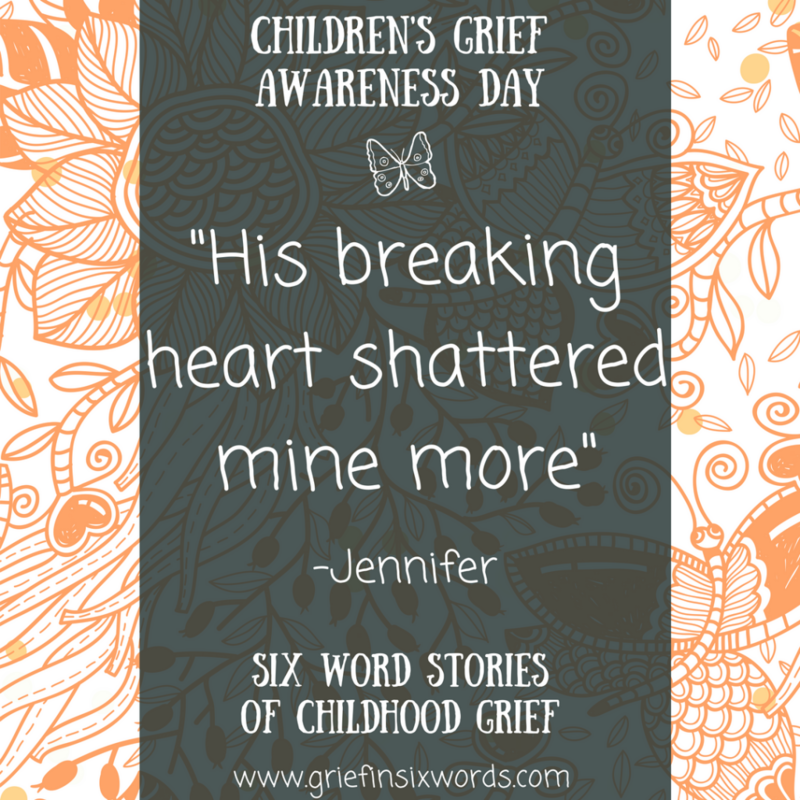 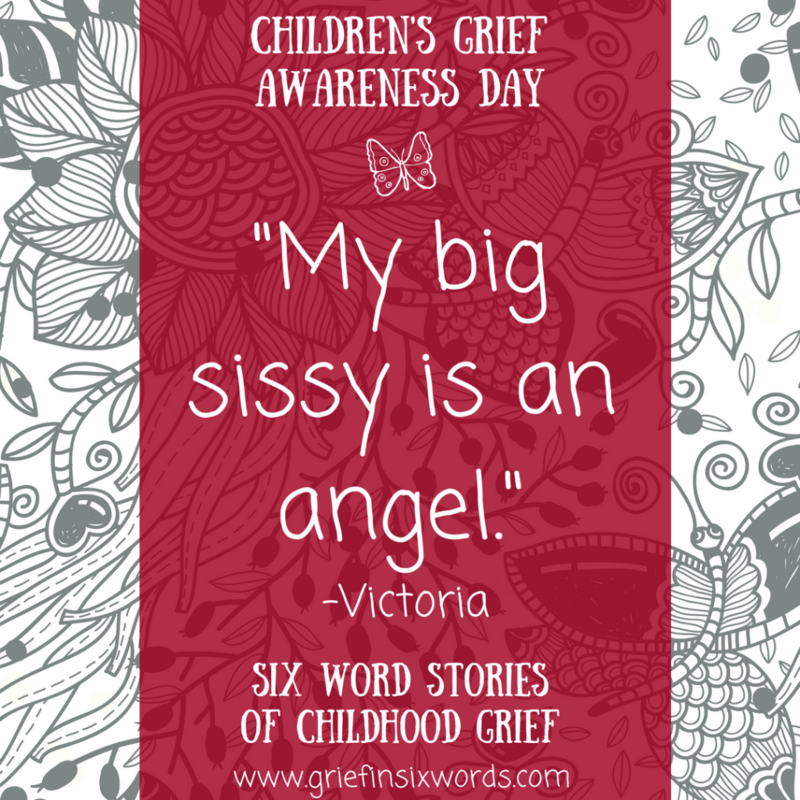 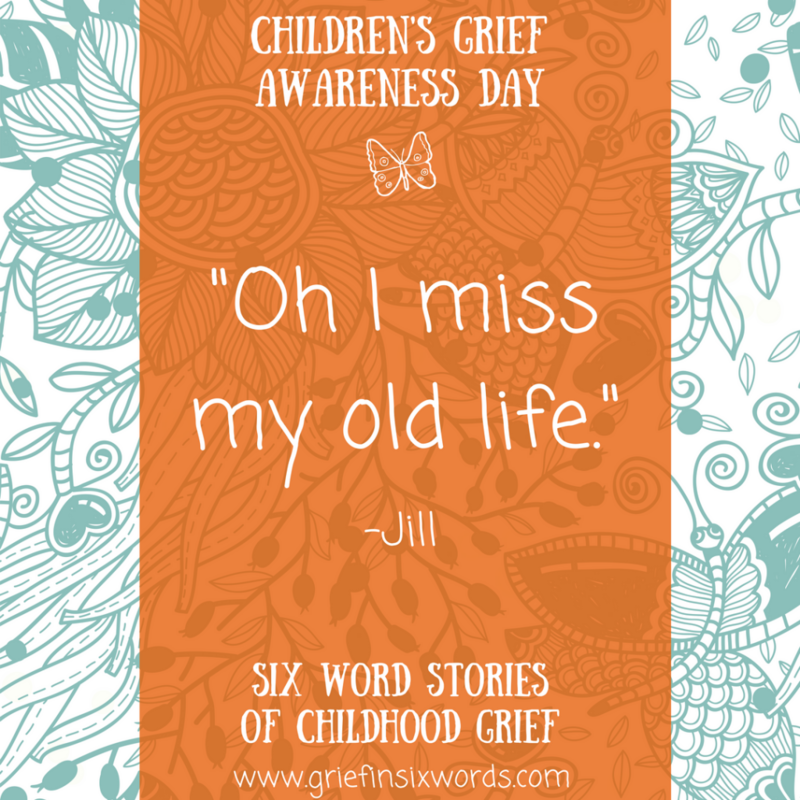 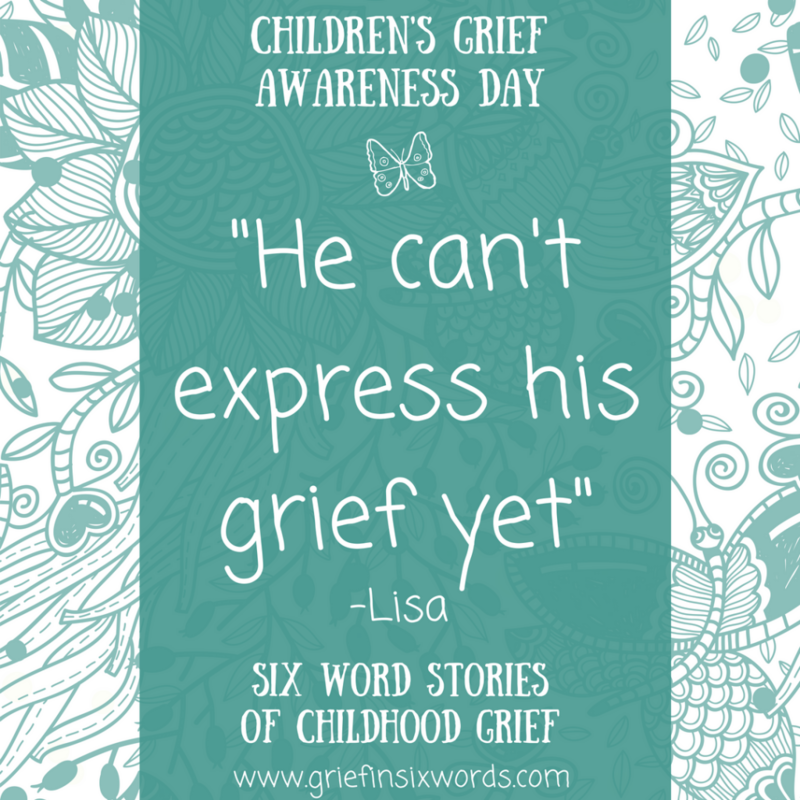 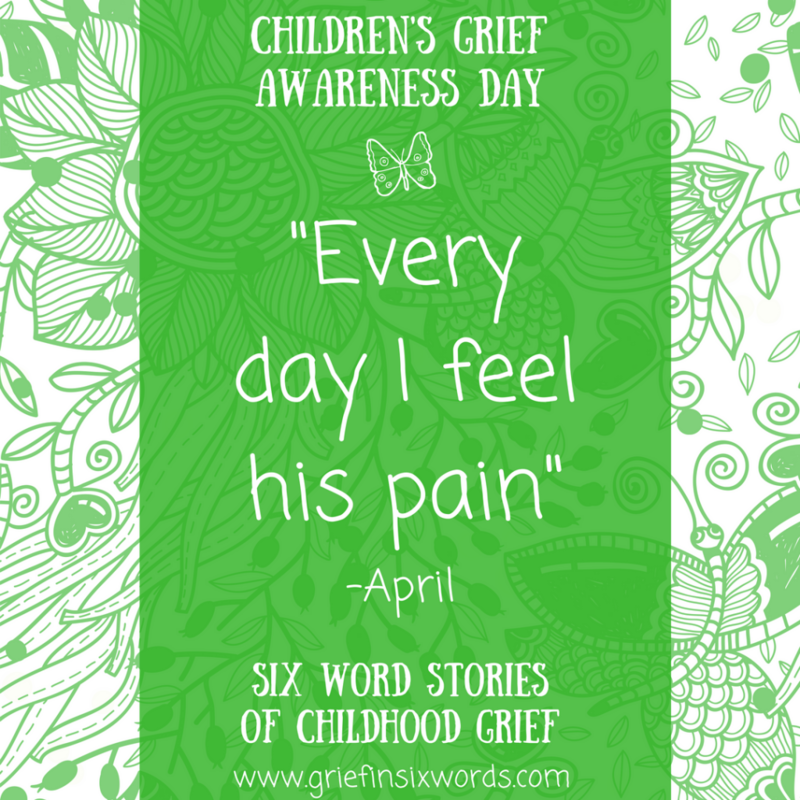 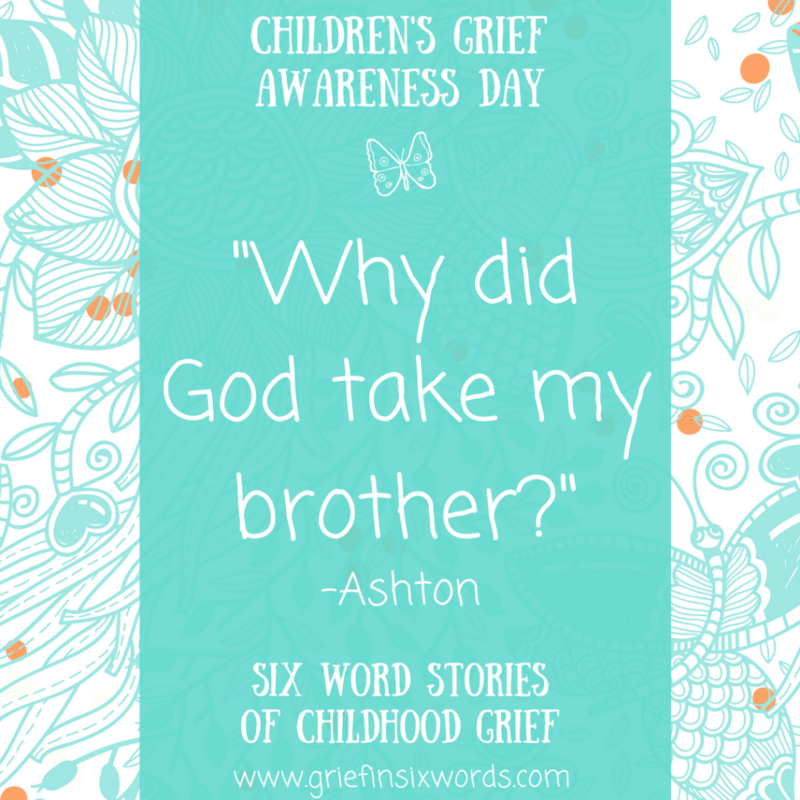 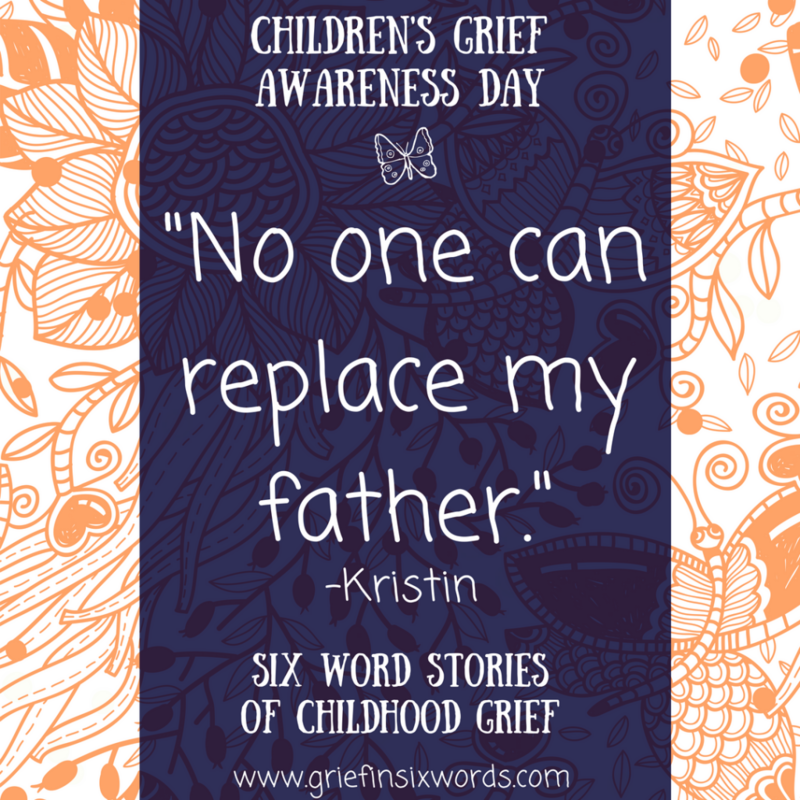 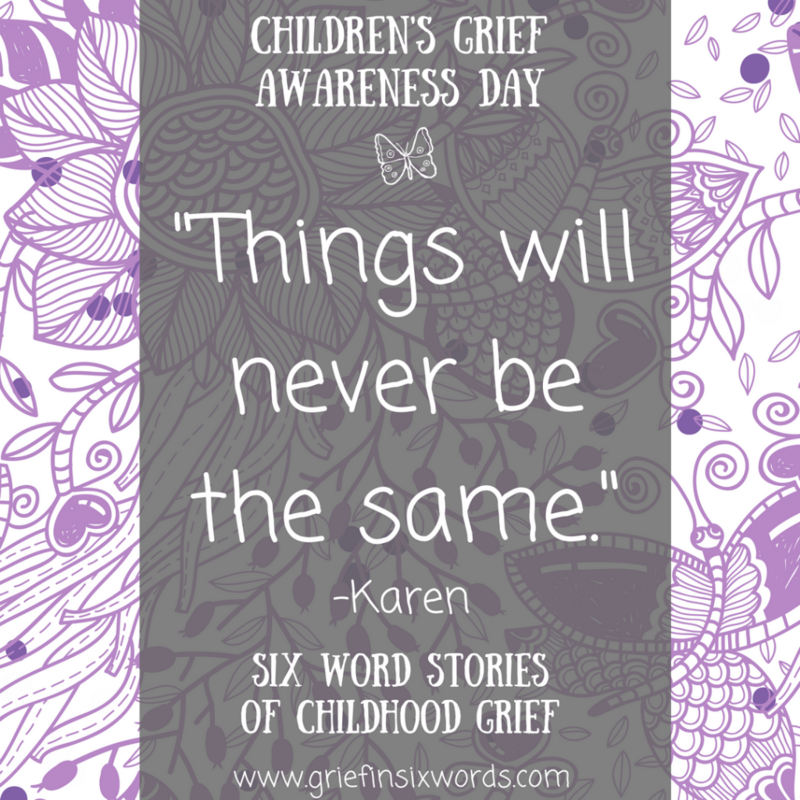 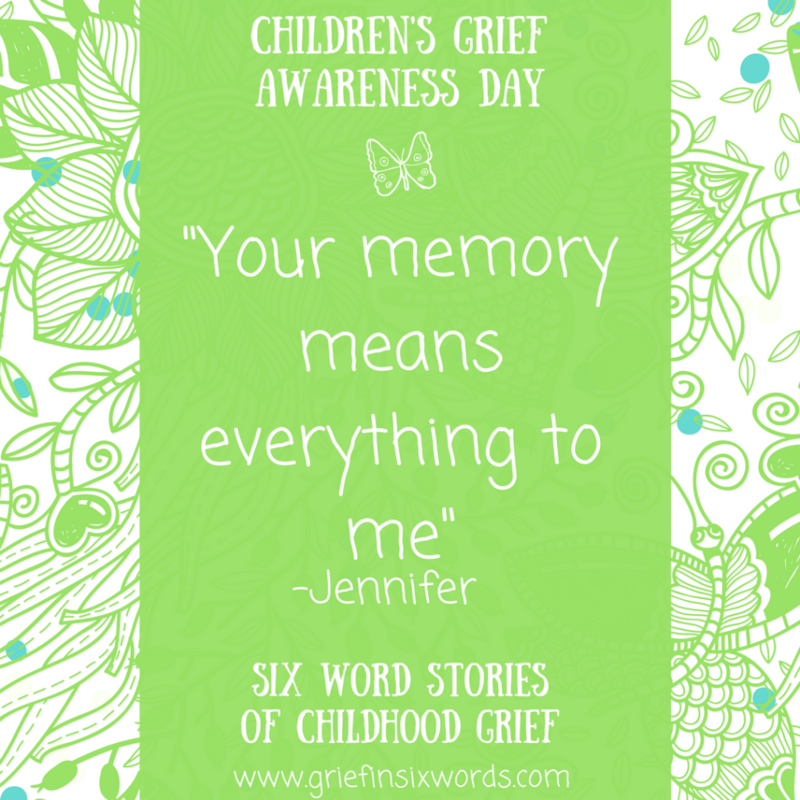 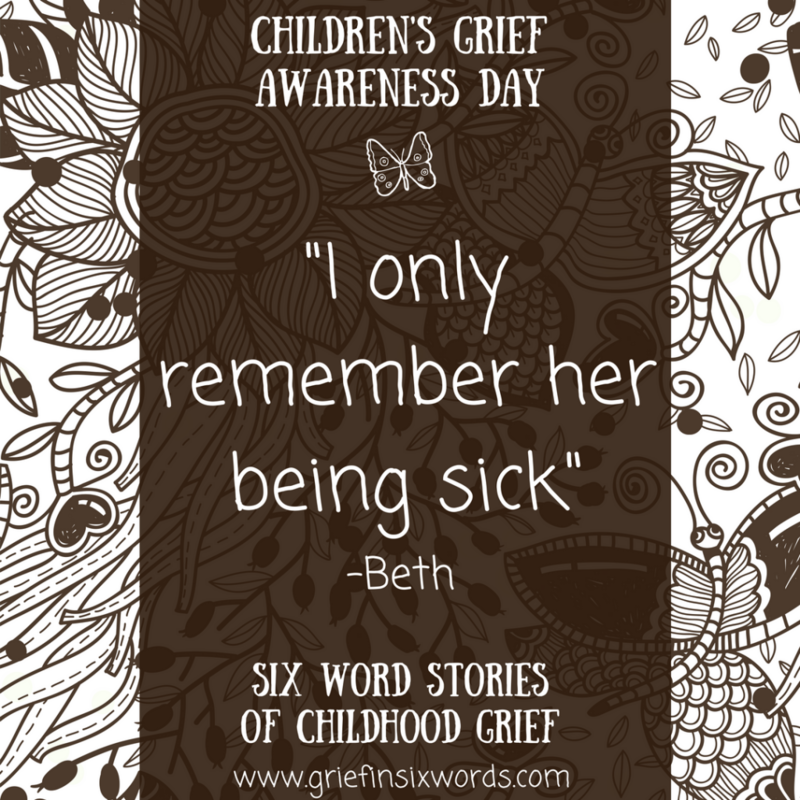 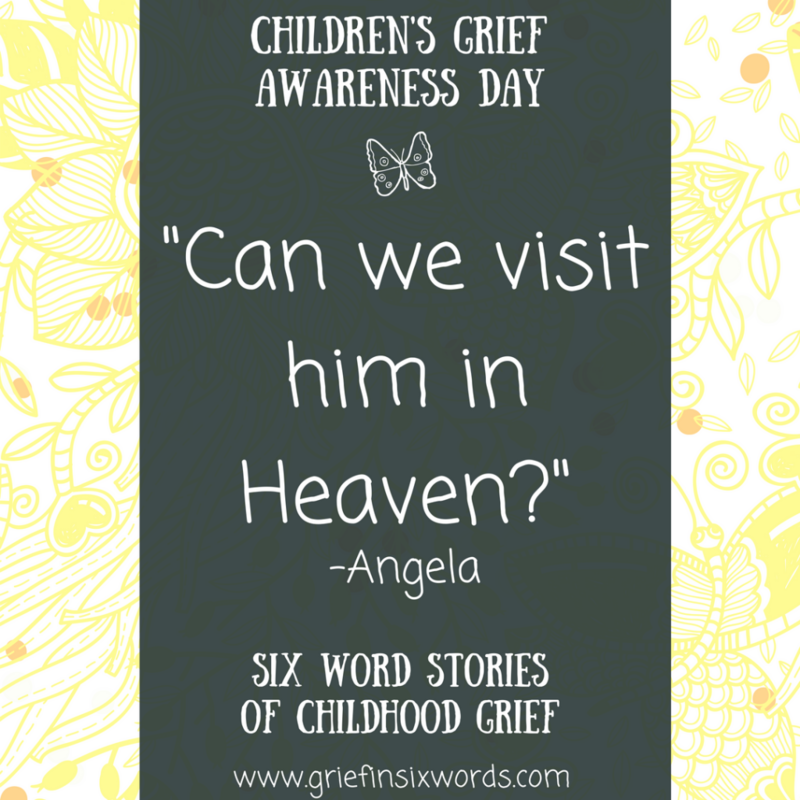 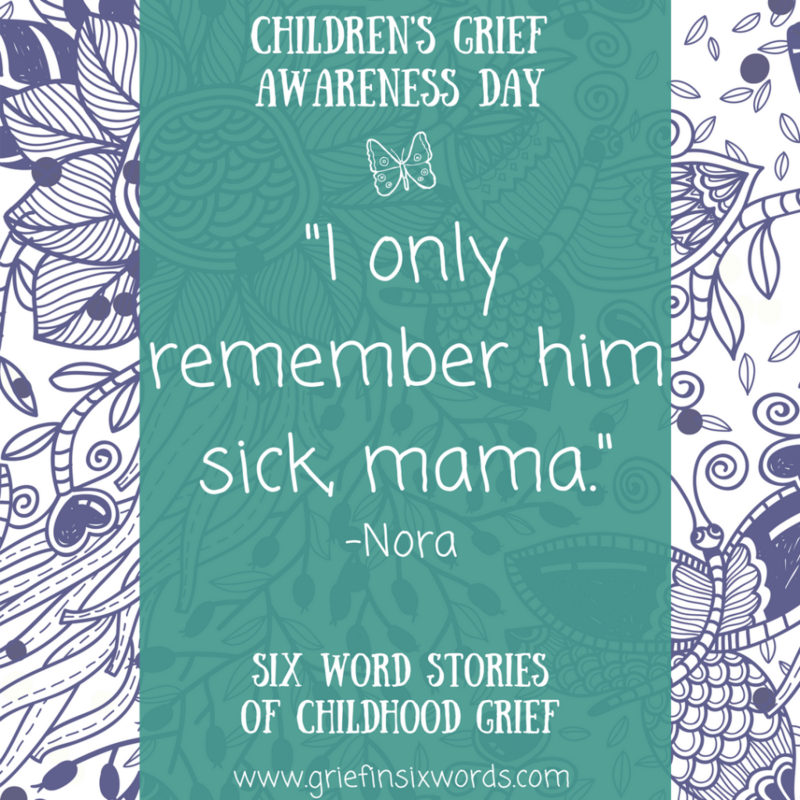 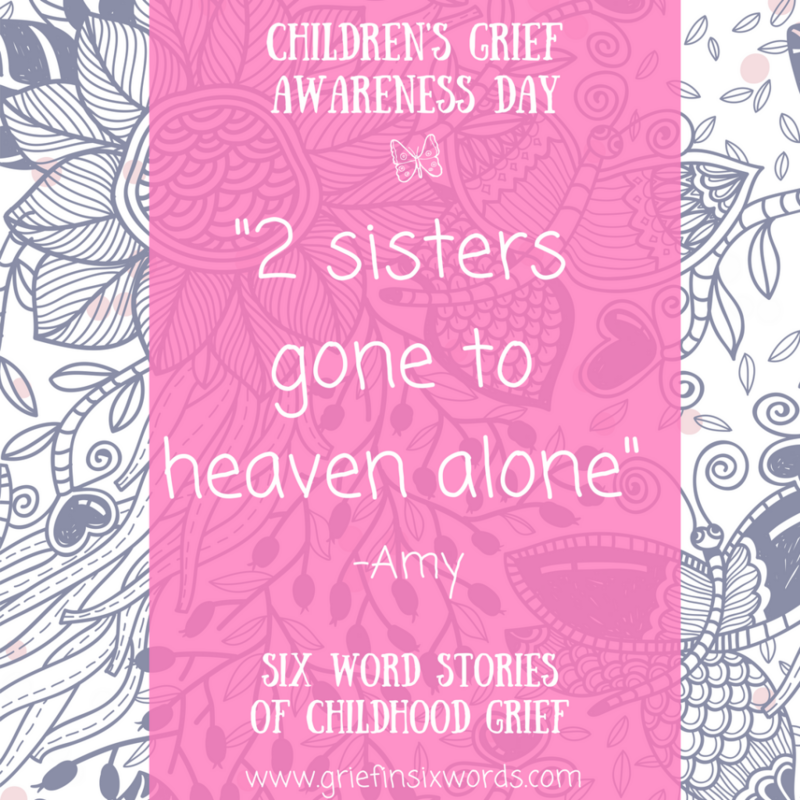 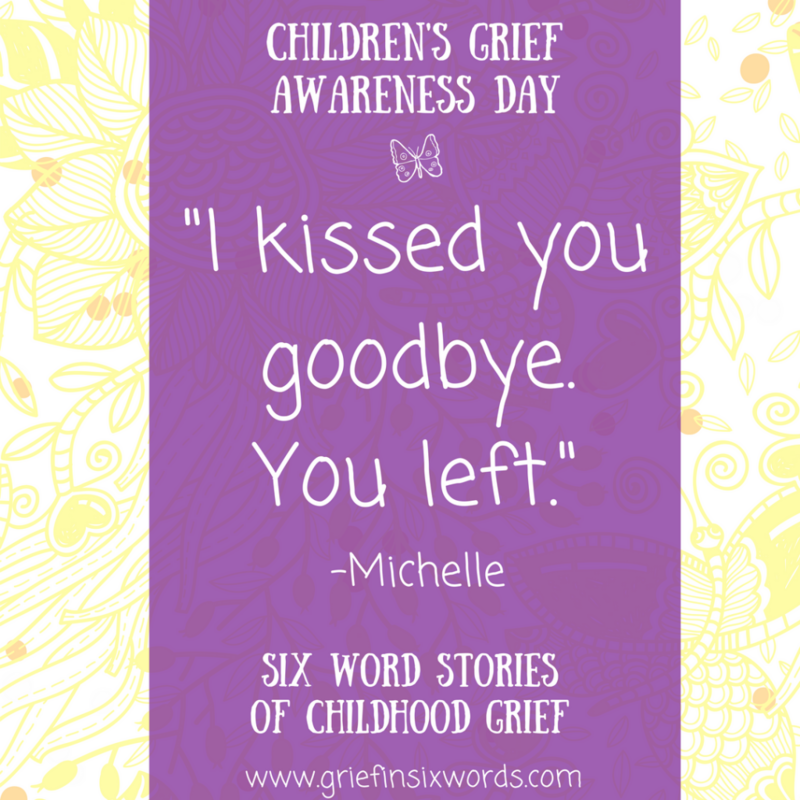 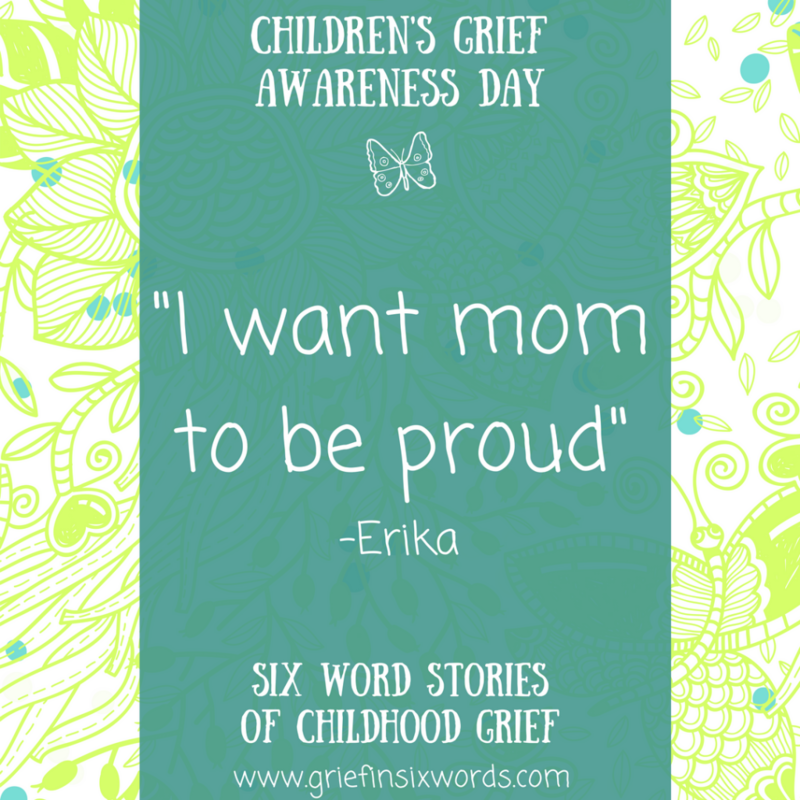 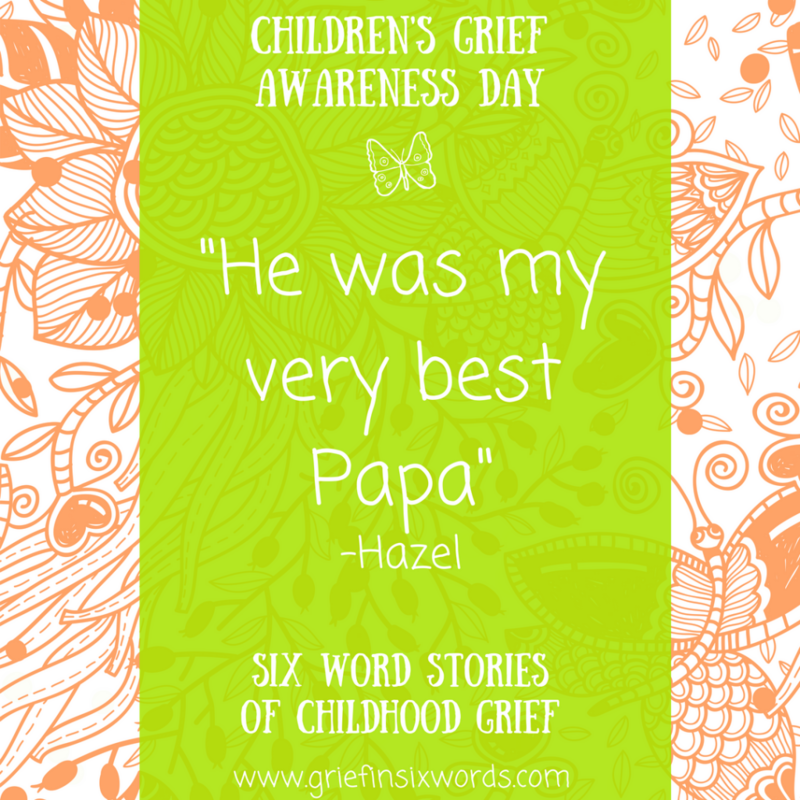 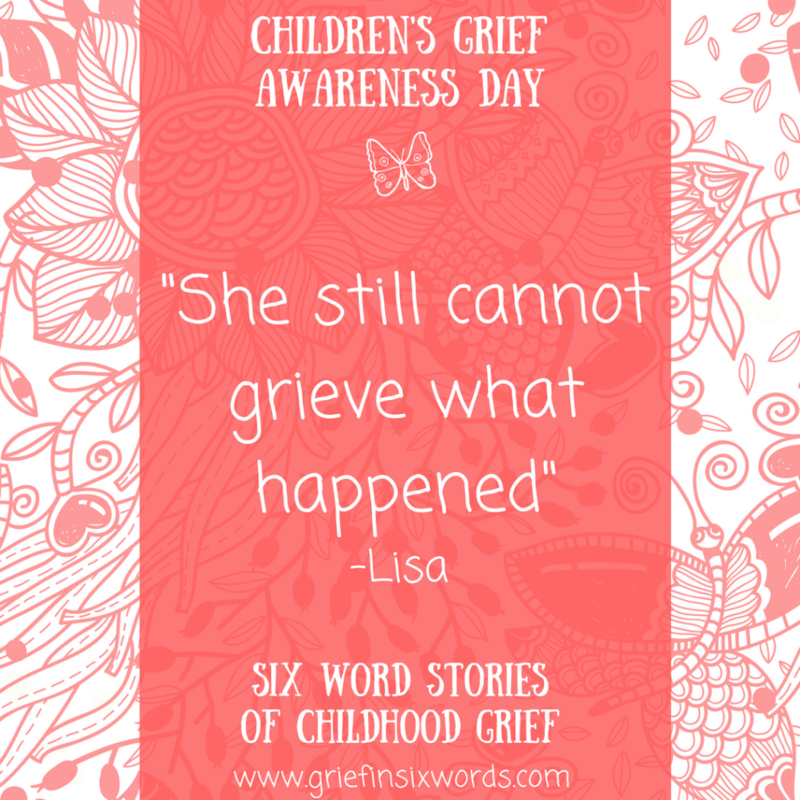 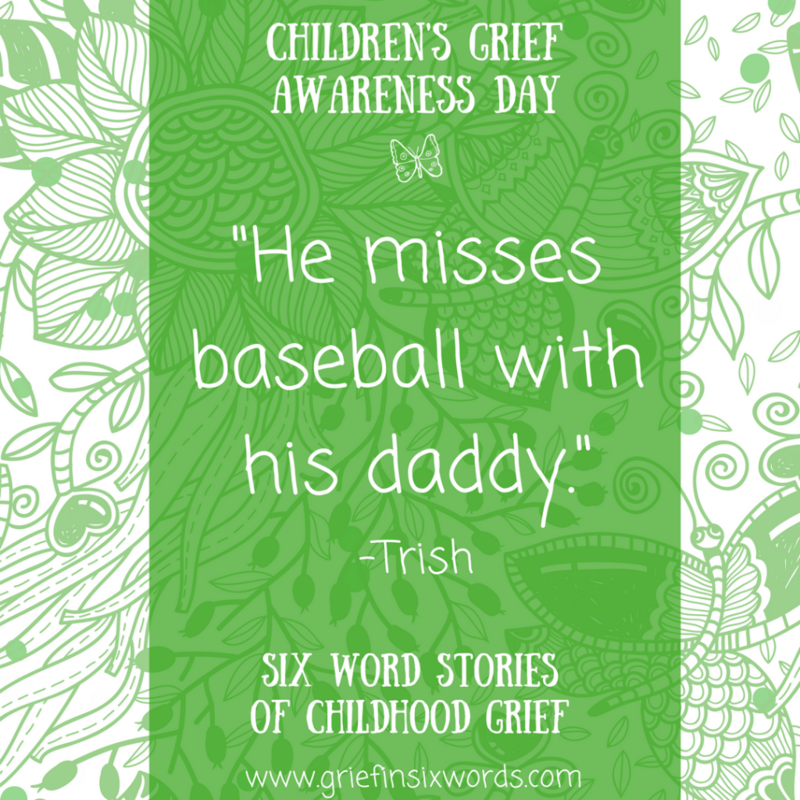 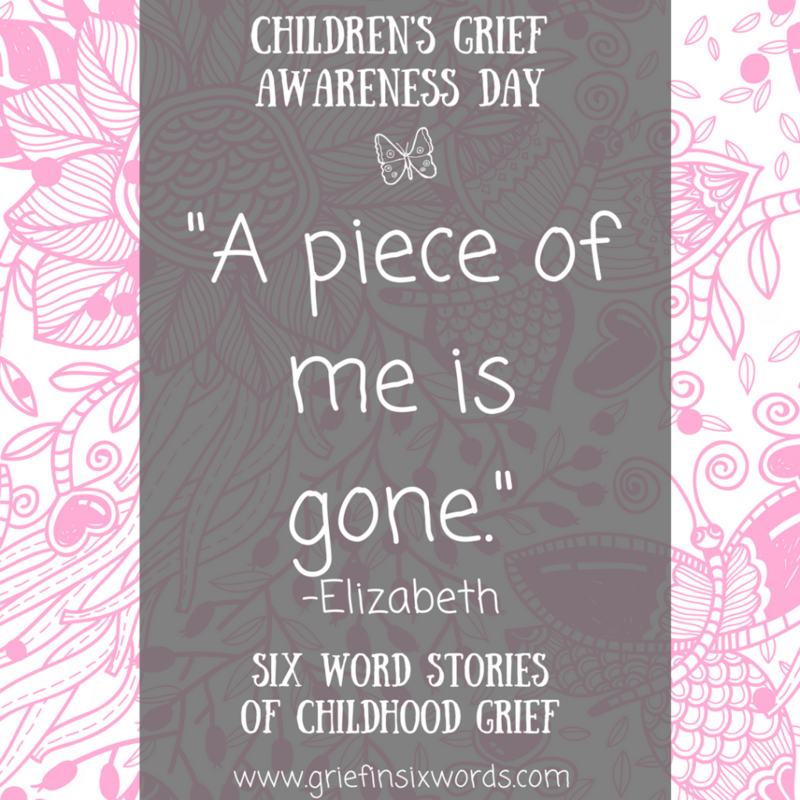 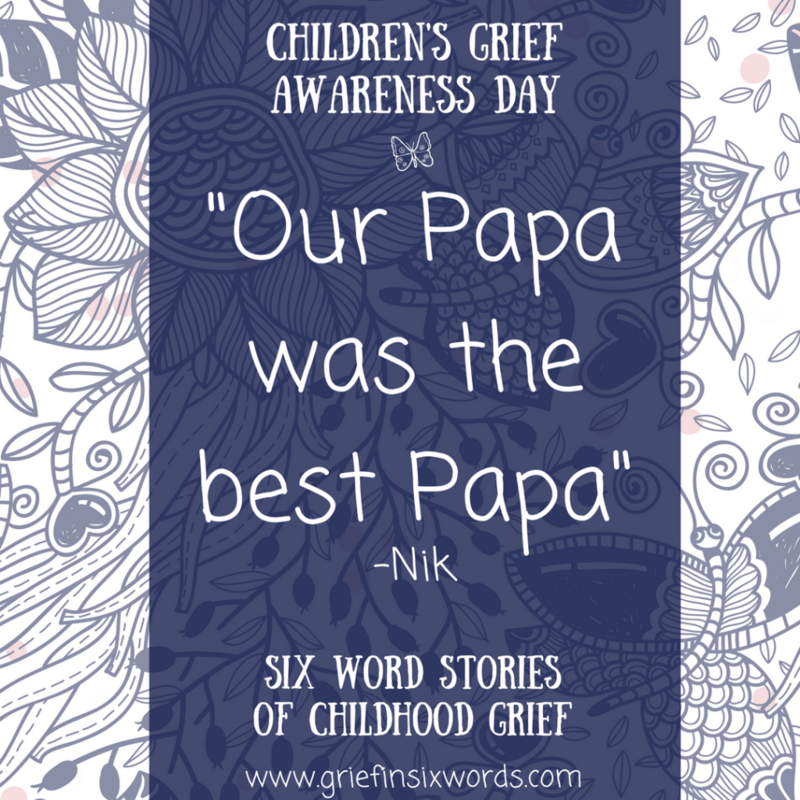 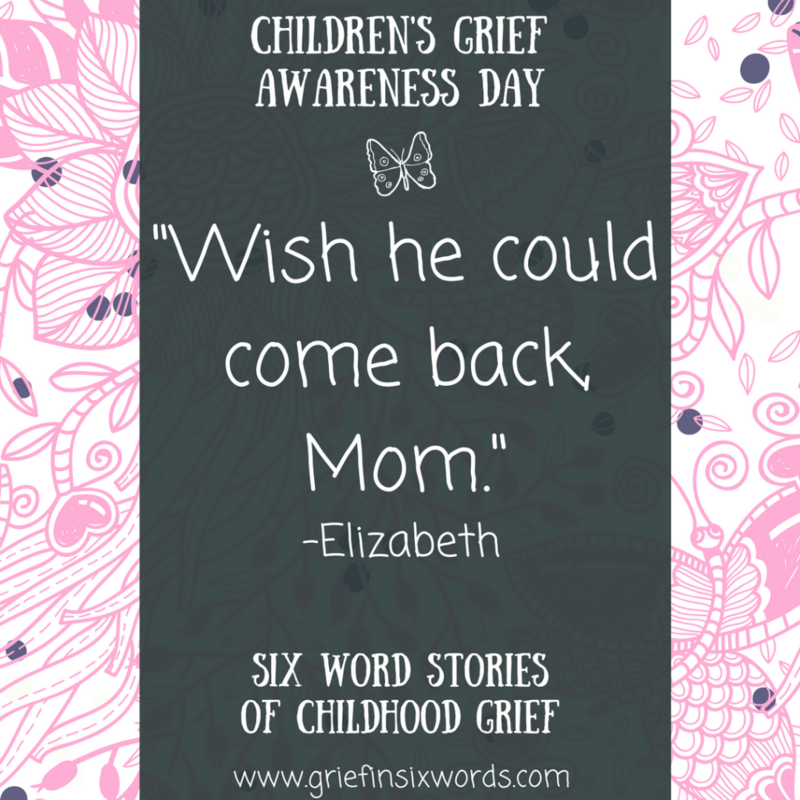 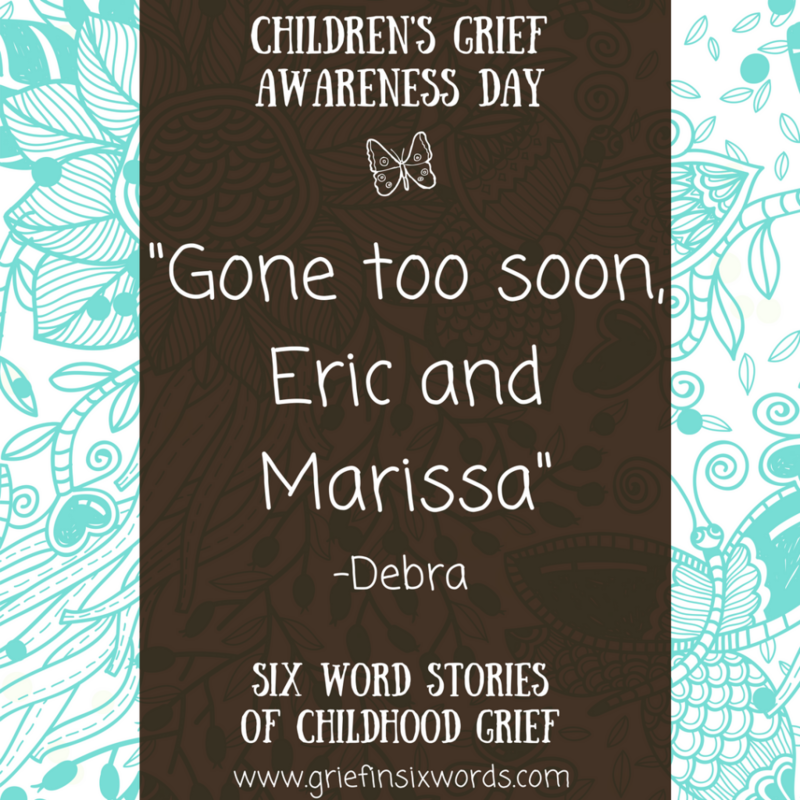 5 responses on "Children's Grief Awareness Day: 64 Six-Word Stories"